Hungama Digital Entertainment Pvt Ltd has launched a website for casual gamers called TheGameBox.com. TheGameBox.com is Hungama Game Studio's GamingHungama.com in a new avatar, with a social gaming angle. Users playing on TheGameBox.com can interact with their friends through chat, compare scores, challenge other gamers etc. Manish Mallik, GM, Hungama Game Studio said, "With TheGameBox, Hungama provides an exciting new platform to socialize and have fun with your friends while challenging them to exhilarating games. TheGameBox is the first of its kind Social Gaming Website, with gripping games spanning across all genres, which apart from entertaining and engaging you, help you connect and bond with your friends." Hungama Game Studio aggregates, develops and publishes gaming content for mobile, PC and television. 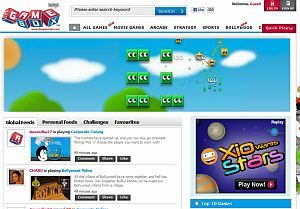 It has developed around 400 flash games for over 100 brands, including 55 Bollywood games. It has partnered with Exponential Entertainment to launch Hollywood and Bollywood based games on the site. Other partnerships by the studio include Tata Sky, Imade, Wild Tangent and BSNL. TheGameBox will also be used to distribute games such as Cricket Stock Exchange, launched recently by the company.